Well in to its decent this Ryan Air Boeing 737-200 enters the busiest time of the day as the workload on flight crew and cabin crew increases in preparation for landing. 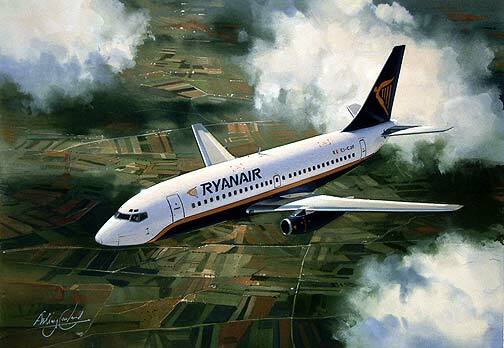 With huge expansion plans coming to fruition Ryan Air is seen as one of the more successful operators in the no frills market. Released as a limited edition of 250 each signed and numbered by the artist Anthony Cowland G.Av.A.